BD Web Services Review 2019: Is BD Web Services a Good Hosting? Bangladeshi web hosting provider BD Web Services has servers located in the U.S., London, and Germany. They offer incredibly inexpensive shared hosting packages for beginners to get started quickly. BD Web Services was founded in 2009. They’re headquartered in Bangladesh, though they host their customers on servers located in the U.S. and Europe. A small team of industry experts run the company with a mission to provide reliable and transparent website hosting. Their services and support are available in English. BD Web Services offers a comprehensive suite of hosting services, including SSD Linux shared, Windows shared, cloud, WordPress, reseller, VPS, and dedicated hosting. Their features are nothing spectacular, but they do offer excellent and nearly all-inclusive packages with almost everything a beginner needs to get started. As you can tell, they offer a decent feature set, even including website building tools with their cPanel. Users get unlimited add-on domains and databases even with the entry-level plan, though with only 1GB of storage you won’t be able to host all that many websites on the cheapest plan. The company also provides free integration with Google Apps and SEO tools to help you extend your online reach. All shared hosting plans include cPanel, which is widely known for its user-friendliness and reliability, along with a one-click installer. But the features don’t stop there: advanced users will love the FTP access and support for PHP (version 5 only), Python, Ruby on Rails, SSI, and Perl. Windows aficionados can check out their Windows ASP/.NET hosting plans, while beginners will enjoy the included e-commerce features such as Zen Cart, Magento, and PrestaShop. While BD Web Services doesn’t own their own data centers, they’ve got a pretty solid offering. They have servers located in a U.S. and Germany data center with redundant network connections, low latencies, and multiple Tier I Internet Service Providers. They also use enterprise-grade hardware with RAID-protected servers, 1Gbps port speeds, and Intel E3 processors. Their plans are very good value for money, although note that SSL certificates and domain registration are added costs. 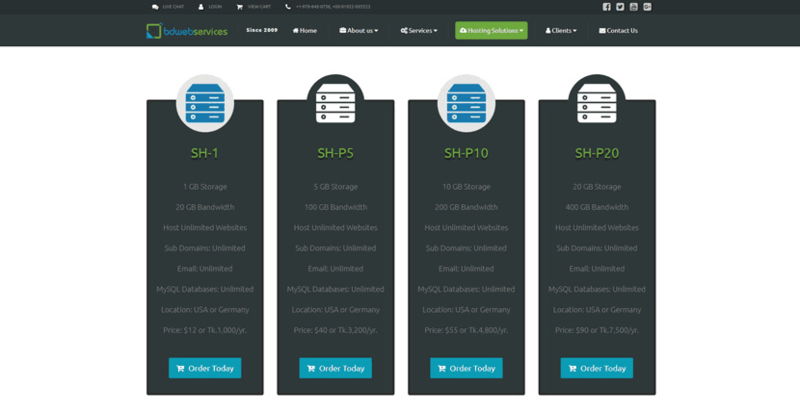 The basic package (SH-1) comes with 1GB storage, 20GB bandwidth, and unlimited domains, making it one of the best inexpensively-priced entry-level packages I’ve seen around. If you need the extra speed, go for their NVMe SSD shared hosting packages, which are still very affordable albeit with less bandwidth and fewer add-on domains included. It’s a little confusing when you start to check out because they add a few extra package levels that aren’t advertised on the main pages. I assume this is to add flexibility and allow customers to choose from a greater level of resources, though it struck me as less than transparent. Secondly, note that their higher-tier plans are available in monthly billing terms, while the cheaper plans are only available as annual contracts. What’s great is that they offer a 30-day money back guarantee. They provide email, telephone (Bangladesh and U.S. numbers), and live chat support. Support is available around the clock, though pre-sales support is only offered between 9AM and 10PM (GMT+6). They have a substantial knowledge base on the website as well as a client area which requires you to log in. Overall, I found this to be a very comprehensive customer service offering. This is a surprisingly good and well-rounded company with a decent selection of features for beginners and experts alike. They may not be the most well known, but this hasn’t stopped them from offering a great service. 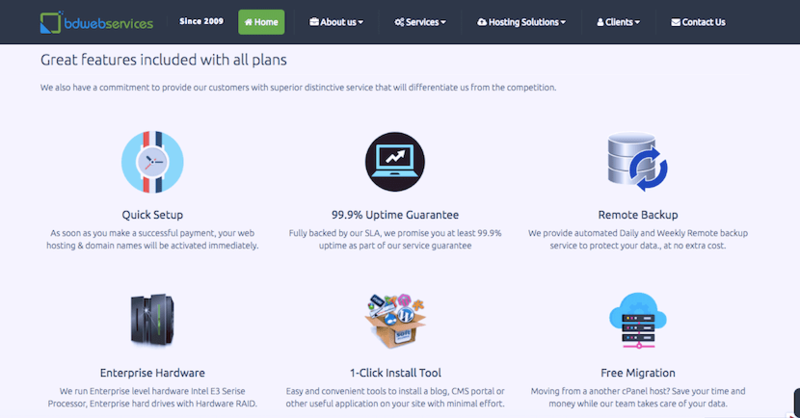 Wondering how BD Web Services stacks up against other Web Hosting companies? Enter any other Web Hosting company and we will give you a side-by-side comparison.